Rainwater Harvesting Tanks and Modular Rainwater Systems are a robust solution for any location looking to successfully collect and store rain water. Used in nurseries, greenhouses, farms, homes, and businesses, these tanks can successfully hold water until later use with irrigation systems, fire suppression systems, sprinkler systems or utility supplies. Models include options for below ground or above ground storage and can be lined with interiors equipped for potable water storage. Depending on your site requirements, rainwater harvesting tanks may include a single tank or complete modular collection system. Systems will include the collection tank, water filter, booster pump, dye injection (optional), and control panel. Please do not hesitate to provide us with your exact storage and collection requirements so we can create a tank or system that can best meet your needs. See below for tank sizes and specifications. View additional styles of tanks for rainwater harvesting. 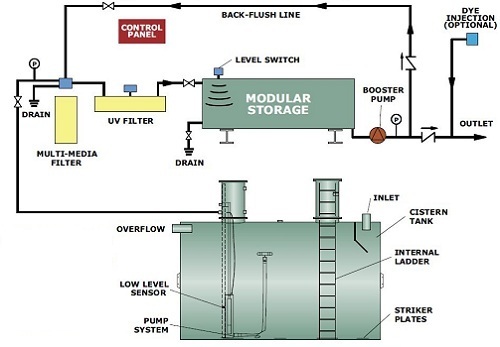 Rainwater Harvesting Tanks and Modular Rainwater Systems Units typically include a control panel, drain, UV filter, modular storage tank, booster pump and and cistern tank. For more information, please view the setup shown below. Rainwater harvesting tank systems are designed to successfully store and collect rainwater for future use. Rainwater collection is frequently used in areas that are prone to droughts or have a limited supply of water. Storing and collecting rainwater can help provide additional water storage when its needed most. We also offer plastic tanks for rainwater storage including a below ground water storage tank and vertical poly tanks.